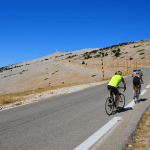 Join the Provence and Ventoux Cycling Weekend with More Adventure! 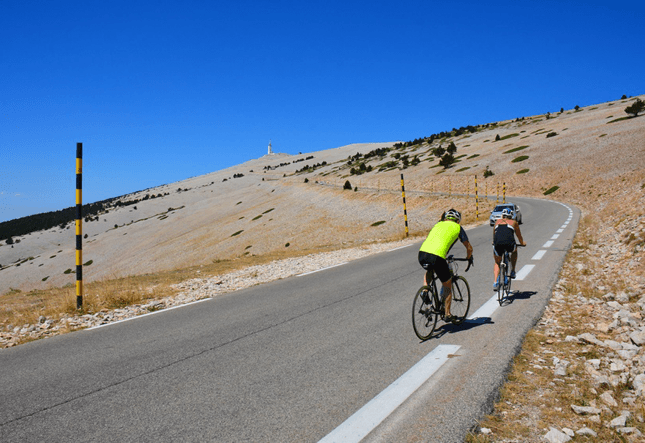 Cycle through the olive groves, vineyards, lavender fields and apple orchards of Provence, finishing with an ascent of one of the most famous climbs in the world – Mont Ventoux. 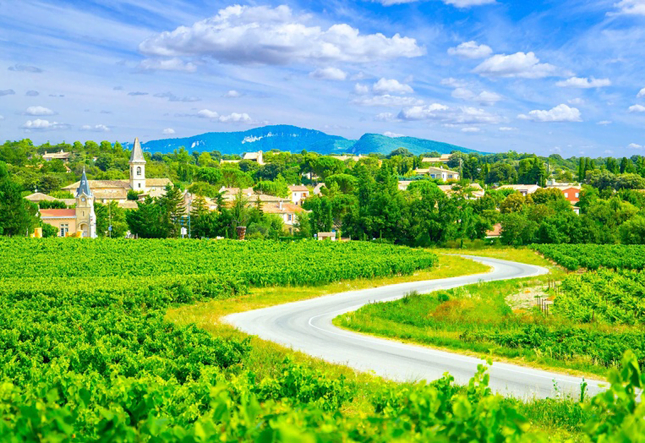 This trip begins in Marseille from which you’ll be transferred to the charming town of Arles on the banks of the Rhone for our first evening. 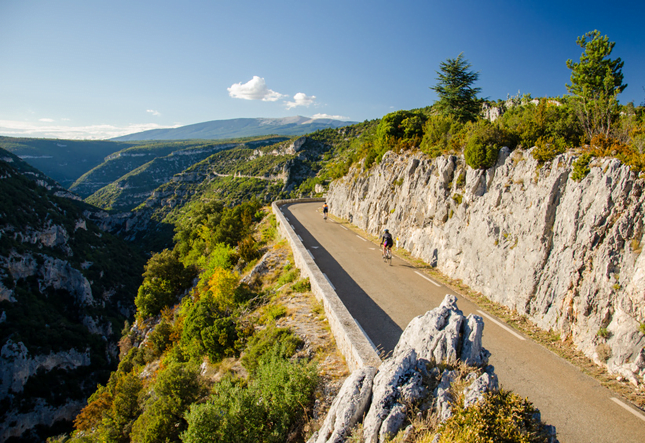 Over the next few days you’ll cycle through the stunning landscapes of Provence, through the Luberon Valley and up the iconic Gorge de Nesque. 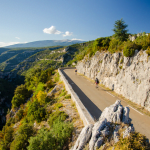 Mountain backdrops, quiet country lanes, tranquil and unspoilt French countryside, hilltop-perched medieval villages, fabulous local food…this really is the perfect cycling destination. 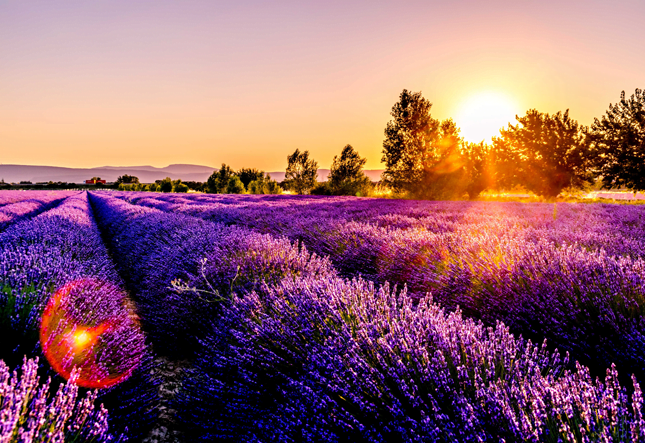 The trip begins at Marseille airport where you’ll be met by the More Adventure team and transferred to our first hotel in Arles. 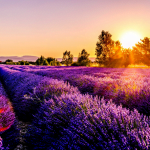 Founded by the ancient Greeks and set around a 2000 year-old Roman coliseum, Arles is a lively town and the perfect introduction to this incredible region. At our hotel we’ll have a tour brief, build bicycles if needed and have our first group meal at a local restaurant. If you’ve decided to take advantage of our bicycle transfer service, this is also when you’ll also be reunited with your bicycle and luggage. 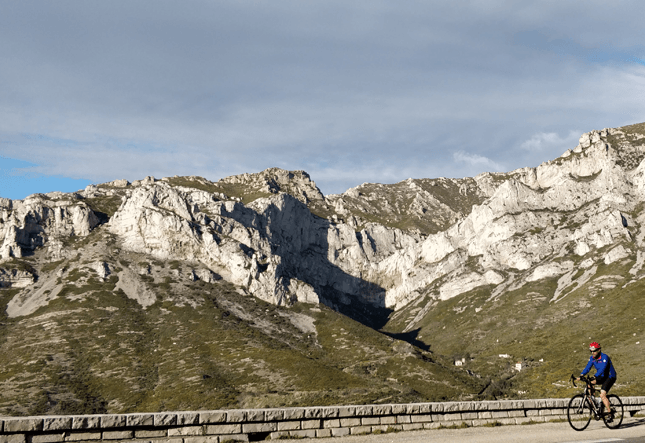 After breakfast we begin our first ride heading east towards the jagged limestone landscape of Les Alpines, a small range of mountains that offer fantastic panorama views of the valleys below. This designated natural park is home to a number of rare species, including Bonelli’s eagle, the Egyptian vulture and the eagle owl. 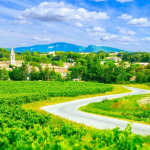 We’ll ride through vineyards, lavender fields, olive groves and almond trees, passing through a number of pretty French villages. 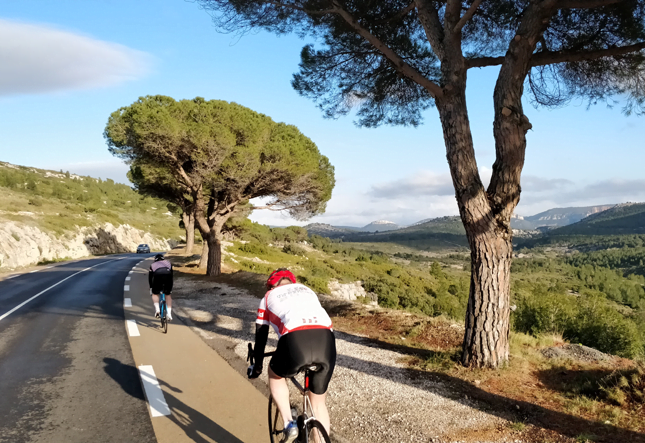 Our route enters the town of Cavaillon which marks the start of the National Park of Luberon, an area of spectacular beauty and home to many fascinating hilltop villages. Our final destination is the sleepy town of Apt. Here we’ll check into our hotel and have a well-deserved evening meal at a local restaurant. 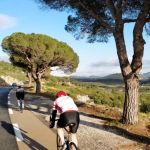 Today’s ride begins by heading northwest through the pretty villages of Rousillion and Gordes. 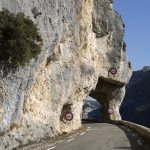 Our route then enters the mighty Gorge de Nesque on a stunningly scenic road. 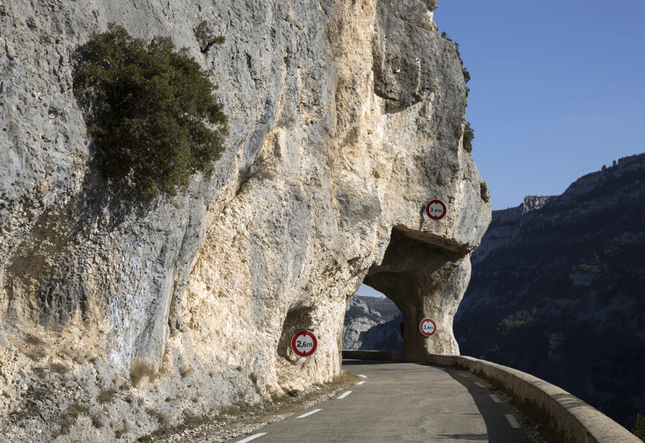 This dramatic gorge is one of the most beautiful in France and makes for an incredible ride. Several tunnels seemingly cling onto the hillside with fabulous views of the valley below at every turn. It’ll be a long and slow climb to the top, but the views will undoubtedly make it worth the effort. Our overnight destination is the town of Sault where we’ll have our evening meal and get some rest before the big day ahead. 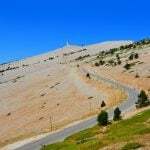 The day has arrived – you’re going to take on one of the most iconic climbs in the world, the mighty Mont Ventoux or the bald mountain. 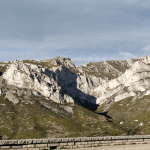 We tackle the climb on what is considered the easiest route, but make no mistake, this is a tough climb whichever way you ride it. 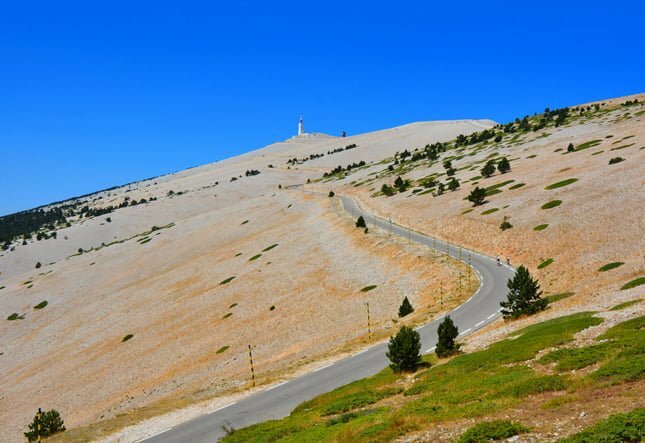 Today’s route is shorter than previous days, but if you are so inclined (and are a sucker for punishment) you do have the option of tackling Ventoux from Bedoin in the afternoon (optional). In the evening we’ll have our final celebratory meal and overnight in Bedoin. 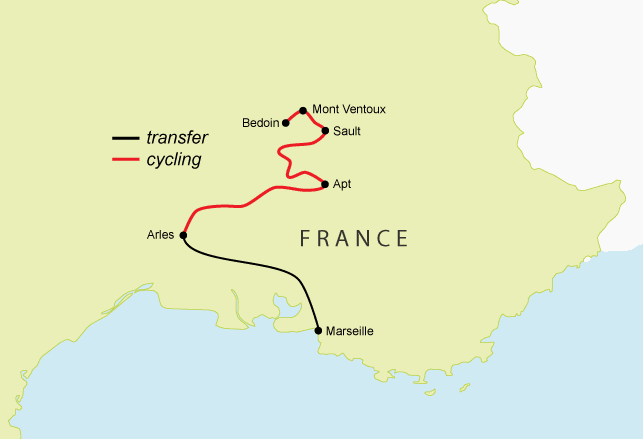 After breakfast in our hotel, you’ll be transferred with your bikes and luggage to Marseille airport for your flight home. Here we say our farewells and the trip ends. Flights costs around £100 - £200 return to Marseille from London.